Statement: " My work is the result of my perpetual pursuit of knowledge and understanding. As a child I realized quickly that the accumulation of information far exceeded the quantity that a dedicated classroom teacher had patience or time enough to teach me. I approach my work initially as a scientist approaches their research. I first gather information from primary sources. As the search images develop I follow a considerably less linear path and am attracted by the unexpected and overlooked. The disregarded records, figures or facts merge and become the atypical moments that facilitate my knowledge of materials, technology and objects. These moments nourish intuition and lead to invention. The combination of research, information and play is the subject of my work.". Chicago: Center for Book and Paper Arts, 2015. Edition of 50. 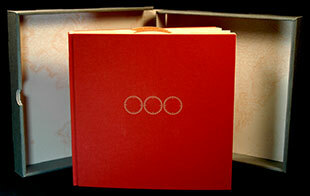 8 x 7.75"; 20 pages. 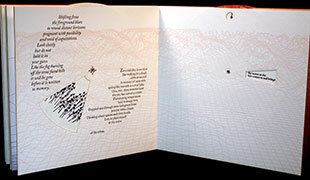 Letterpress printed and laser-cut at Small Craft Advisory Press, Florida State University. 9 bound volvelles. Printed on Legion Bamboo paper. 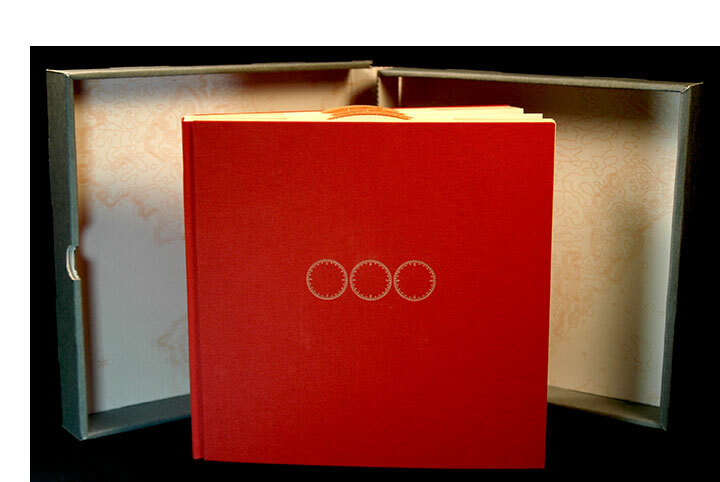 Bound in red book cloth. Numbered. 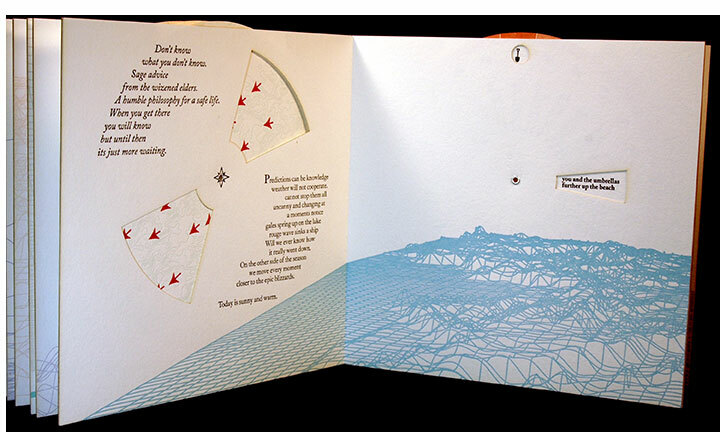 Promotional statement: "Through laser-cut rotating wheels (volvelles) Rain/fall proposes a new poetic form determined by weather data, where each page contributes two lines to a poem assembled by the reader in accordance with the local forecast. Designed by Denise Bookwalter and fabricated at Small Craft Advisory Press at Florida State University, the book is part of a hybrid project: a companion app, engineered by Meg Mitchell at the University of Wisconsin, and available free of charge on Apple’s App Store, performs the same function digitally, accessing local weather data through GPS. "While the digital affordances of the app are possible only with recently developed mobile devices, the book incorporates a mechanical computing technology devised by Persian astronomers in the 11th century. Together, the two versions dramatically illustrate expanded possibilities for the book form, both physical and digital, and the radical changes in literary practice that publication with new media can now enable." www.rainfallbook.com: "The project Rain/fall accentuates the physicality of the book and the possibilities of contemporary mobile technology combining these seemingly disparate forms to create a complementary cross platform reading experience. Rain/fall is driven by geography and weather. The text in both the app and the book is determined by where the reader is and what weather the reader is experiencing at that location. In the app the reading experience is driven by location and weather data culled from a live database, while in the book the experience is driven by the reader who inputs his or her own weather data. "Through mechanical means, Rain/Fall achieves the same poetic outcome as its companion app, generating a poem determined by the weather. A set of nine bound volvelles (wheel devices) display couplets keyed to icons, in turn linked to current meteorological conditions." 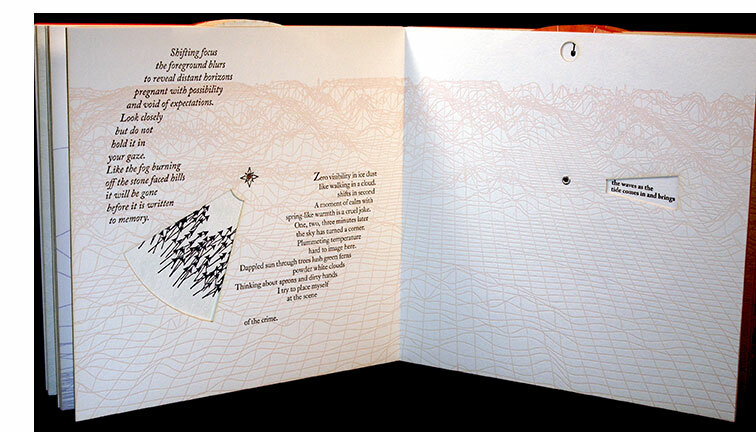 Colophon: "With the book, readers can choose their current local weather condition on the volvelle at the front of the book then turn the volvelle on each page to the matching icon to read the corresponding poem." Tallahassee, Florida: Denise Bookwalter, 2017. Edition of 10. 12 x 4 x 2". Laser cut. Printed at Small Craft Advisory Press in Tallahassee, Florida, on Japanese Hosho paper. Post bound with stainless steel screws and cloth over boards. Signed and numbered by the artist. 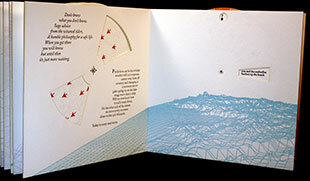 Envelope is an artist book about lighter-than-air flight, reflecting on its beauty and destructive power. Colophon: "Envelope began in the summer of two thousand and eight when I traveled to Ohio and Germany to visit the archives of the Goodyear Blimp Company and Luftschifbau Zeppelin. . . .Between the pages it whispers about a summer of searching, of coffee breaks as newlyweds on the shore of Lake Constance, and all of the time between now and then." The many definitions of envelope include the one for the gas bag that suspends the gondola of an airship or dirigible balloon. 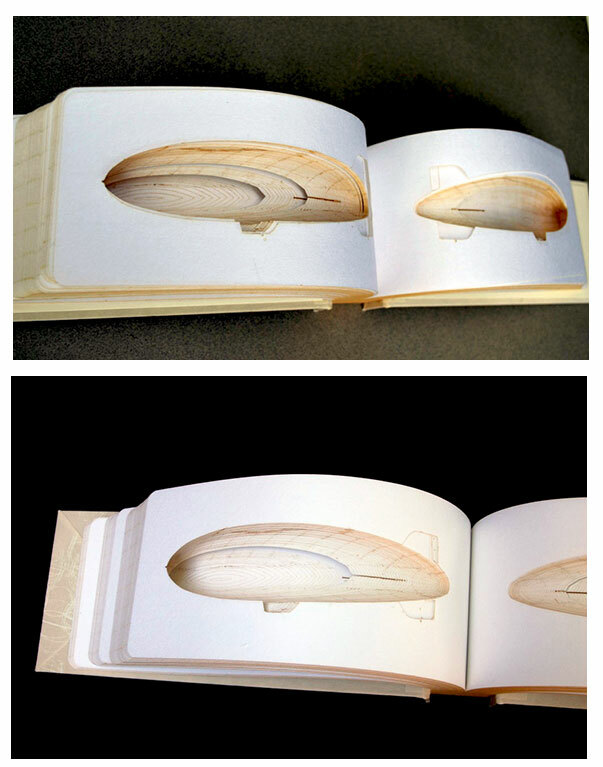 In Envelope the airship's envelope is revealed as developing space when one turns the pages. 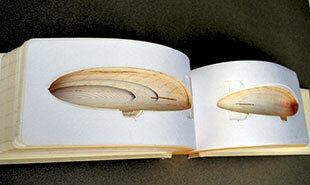 The complete dirigible shape takes form and disappears as one pages through the book.